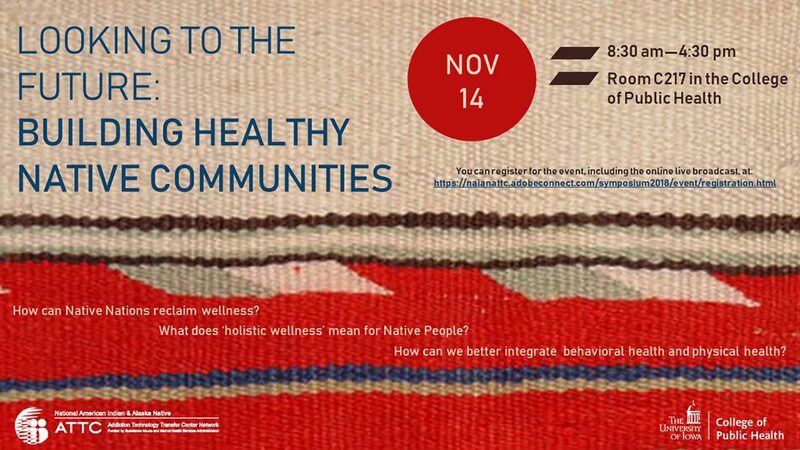 “Looking to the Future: Building Healthy Native Communities” will take place Nov. 14 from 8:30 a.m. to 4:30 p.m. in C217 CPHB. Registration, including online live broadcasting, is available online. The symposium is hosted by the National American Indian & Alaska Native Addiction Technology Transfer Center based in the College of Public Health. Individuals with disabilities are encouraged to attend all University of Iowa-sponsored events. If you are a person with a disability who requires a reasonable accommodation in order to participate in this program, please contact the College of Public Health in advance at 319-384-1500.